Daily budget is a simple app that helps create a budget. The users enter their regular income, their montly recurring expenses, and their saving goal. With the balance, the app calculates a daily budget. The user is then invited to add expenses, on a daily basis, as they come in. The breakdown of the budget per day really helps the user to know how much money is available and to think about their spending habits. 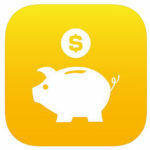 This app encourages saving by calculating a saving amount prior to entering spending. The app does not connect to bank accounts, so there is no need to enter online banking log in data. Learners could find this app useful when learning about banking and money management. It can be installed on a smartphone (iPhone only) to experience, on a daily basis, the management of a budget. The free version includes advertisement.